Check out the city website for a host of information on what Milton has to offer. The City of Milton will provide opportunity and value in a responsive and responsible environment through active partnerships with the community and its stakeholders. Milton is a distinctive community embracing small-town life and heritage while preserving and enhancing our rural character. In 2011, the City of Milton was recognized as having the highest quality of life in the state of Georgia and ninth-highest quality of life in the southern United States by the Business journals’ “On Numbers” survey. To read more about this honor, click here. State Rep. Jan Jones introduced the bill for the City of Milton in January 2005 with the intent of moving the bill forward in January 2006. This gave residents one full year to consider all the ramifications of cityhood before the bill could become law and 18 months before a citizens’ referendum. A City of Milton committee worked diligently to help coordinate information and research. On March 9, 2006, the bill creating the new city of Milton passed in the house (127-21) and passed in the Senate (49-0). At 2:00 p.m. on Wednesday, March 28, Governor Sonny Perdue signed HB 1470 into law. Review the full city charter, including articles of incorporation and powers. In an overwhelming show of support, on July 18, 2006, 85% of voters approved the City of Milton referendum. The city’s first general election for mayor and city council was held on Tuesday, Nov. 7, 2006. On Dec. 1, 2006, the city was incorporated and adopted Fulton County’s ordinances. It has since worked to create its own model of governance utilizing public-private partnerships to leverage cost savings while providing quality municipal services. Milton has a population of 32,661 people (click here for more information) and covers 23,000 acres. 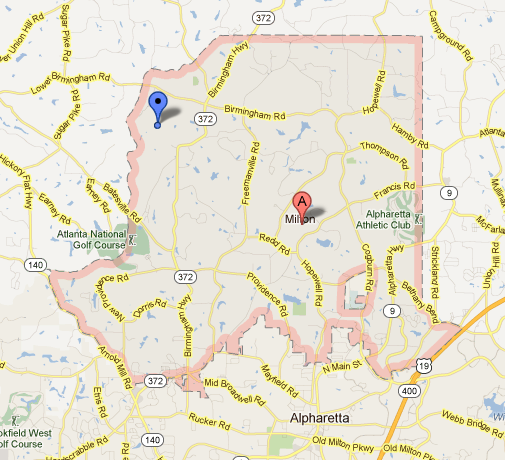 It includes the northwest unincorporated island that is bordered by Cherokee County to the north and west; Forsyth County to the east; Roswell city limits to the southwest (a little west of Arnold Mill Road); Alpharetta city limits to the south (roughly, Mayfield Road to Cogburn Road to Windward Parkway). Named after Revolutionary War Hero John Milton, the City of Milton is a part of Fulton County with County Commission representation.